After a long week, grilling burgers on a grill pan is the perfect way to quickly prepare a simple meal without having to spend hours in the kitchen. The following burger recipe, I refer to simply as a California burger, even though it does not contain any avacado like the burgers at most restaurants with the same name. 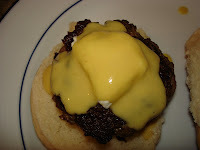 To make this burger, prepare the sauce by mixing the dijon mustard, meyer lemon juice, and honey. You can substitute regular lemons or lemon juice if you cannot find meyer lemons. Meyer lemons are native of California and have a sweeter, distinctive taste compared with regular lemons. I was able to buy them both at Whole Foods and a wonderful market here in Park Slope called Union Market (only a few blocks from my condo and they also sell quince, papaya, key limes and at least 12 kinds of mushrooms). Grill the burgers on the grill pan and top with the goat cheeese for the last minute of grilling, covering with aluminum foil. Season with pepper, toast the buns and your California burger is read to eat.